The second incarnation of the Kia Picanto was launched in 2011 in Geneva. Four years later, Kia’s baby remains a favourite right across the world. That could have a lot to do with the way it looks – the Picanto is just so darn cute. And now it’s just got cuter. The new version made its debut in Geneva earlier this year and now it’s reached the UK. You have to admire the ethos of the Picanto – that a cost-effective vehicle shouldn’t have to compromise on features or style. The 2011 Picanto was highly appealing and all the factors that made it that way still apply. This car has value in spades. There’s natty styling, a quality cabin, engines that go forever without a drink, and amazing equipment as standard. With carefully chosen enhancements, the Picanto has a much more high-class feel. The line-up stays the same (two versions), but the outward appearance has changed. There’s a sharper front end with a smart new bumper and a grille that seems to snarl a little. The new bumper is flatter and squarer, while the air intake is a single unit. The fog lamps now work as daytime running lights that come on automatically. There’s a hint of a front spoiler, which gives the car a slightly sporty edge. That continues down the flank with a strong, dynamic look. The rear is uncluttered but comes with a tweaked bumper with a snazzy matte-black edge that holds the fog lamps. On the 1.2 EX, you get tasty 15-inch alloys. The interior has also been tweaked to add to the upmarket feel. The audio kit is now embedded in a more modern fascia. As standard, there’s air-conditioning, retractable cup holders and all sorts of connectability options. The EX comes with Bluetooth. Both the 1.0 LX and 1.2 EX will give you front airbags, while ABS anti-lock braking is fitted on the larger-engine model. Safety gets more than a nod, with the inclusion on the 1.2 of an ESS (Emergency Stop Signal) system. If you brake hard, sensors alert the brake lights, which flash drivers behind you three times. Both models get ISOFIX seat anchors. The two chosen engines are the Korean company’s most efficient Kappa units. The 1.0-litre LX gets a three-cylinder, 998 cc unit, while the 1.2 EX features a four-cylinder, 1 248 cc engine. Both cars come in manual or automatic transmission. The Kia Picanto is still a good, solid purchase for city buyers looking for value for money, head-turning looks and that amazing seven-year warranty. 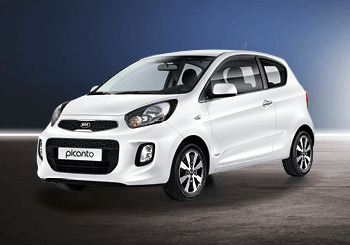 You can test drive the Kia Picanto at Howards Group’s showroom in Weston-Super-Mare. Pop in or call us on 01934 332700.